MARY is a short sleeve midi linen wrap dress. This is a wonderful, versatile dress! I think I will be wearing it a lot this summer. The shop owner was very helpful in suggesting a size for me - it fits perfectly. I chose the color “blue jeans” - it is a really wonderful periwinkle/medium blue (somewhat between the two). 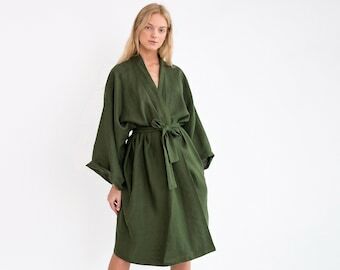 I will layer a light cotton full slip under this, so I don’t have to even think about the wrap getting loose, but I could definitely see the me of 20 years ago not bothering with a slip - it really works either way. A lovely, well made dress in a high quality material! Thank you so much! Beautiful dress, and great communication! I will absolutely be purchasing more from this shop in the future. Thanks!!! I LOVE LOVE LOVE MY DRESS!!!!! I WILL BE ORDERING AGAIN! BEAUTIFUL LINEN! THANK YOU!!! !